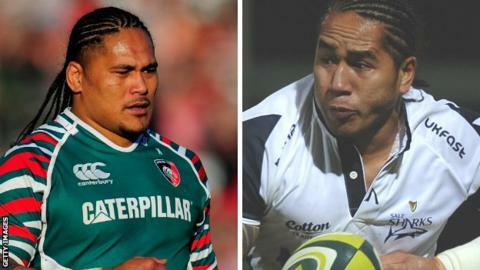 Samoa internationals Alesana and Anitelea Tuilagi have joined Newcastle Falcons for the 2014-15 Premiership season on two-year deals. The brothers, 33 and 27 respectively, will arrive from Japanese club NTT Shining Arcs and Newport Gwent Dragons. Both players can play across the three-quarter line, at wing and centre. "Alesana and Anitelea are quality acquisitions, and have bags of experience at the very highest level," said director of rugby Dean Richards. "They have physicality and pace, which is what you need to be successful." Older brother Alesana won three Premiership titles with Leicester - where sibling and England centre Manu still plays - while Anitelea also represented the Tigers and Sale Sharks at Premiership level. "I'm extremely excited at the prospect of returning to the Premiership with Newcastle," said Alesana. "Newcastle is a big club with huge potential, and under Dean Richards there is an exciting vision for rugby in the North East which I want to be a part of."